November | 2011 | Extollagy! Some buildings seem somehow to embody the landscape in which they are set. It’s particularly true in the flatlands of East Anglia, where from Crowland to Ely magnificence, mystery and tragic, broken beauty seem to jostle together in building after building. And then there is the northern half of this landscape, today thought of as an extension of the fens, but in fact something different: Marshland. The Fen is fresh water: a great sump filled by the rivers of Cambridgeshire, Nottinghamshire, Norfolk and Suffolk. That water makes its way slowly to the sea, where it merges with the widemouthed Wash. But that merging is gradual: a flat universe of mudflats, a tidal wetland of salt water and reeds. It’s the salt water, and by implication proximity to the sea, that distinguishes marsh from fen, though the point at which one becomes the other is never clear: this is a landscape of mergings and gradations. But from a distance to the two are suprisingly distinct: here, http://maps.google.co.uk/?ll=52.606384,0.126343&spn=0.610477,1.897888&t=h&z=9&vpsrc=6, the Fenland is black, the Marshland white (though on the ground it is more brown than white), and the Wash sea-coloured. And the simple reason for this clarity is that once, relatively long ago in historical time, but remarkably recent geologically, this part of the country was itself sea, the Wash an even greater, wider mouth. Suprisingly, it is marshland that is easiest to drain. Fenland’s peaty soil shrinks when dried out, and then everything re-floods. With marshland, one only need build a barrier big enough to hold back the incoming tides and the land behind it converts to magnificently fertile farming country. The downside of this is that the impact of an exceptional tide or storm can be catastrophic. Not the episodic sinking and resinking of fen, but dramatic and disastrous inpourings of energetic, heavy water; a man made East Anglian tsunami wave. Still, the only technology one needs to create (and re-create) such country is the ability to martial a large workforce ready to do a lot of hard earthmoving. Whoesale Fen drainage, as opposed to the bit by bit approach that has gone on for centuries, really needs pumps. The presence of an early such barrier, the ‘wall’, very possibly going back to Roman times, is marked by a series of names in the Marshland: the wal-pole; wal-ton. West Wall-ton is one of htem. Such parishes, relatively early, formed part of a reasonably permanent and largely contiguous land bridge running along the coast and linking Lincolnshire with Norfolk, seperating Fen from open sea. And they were rich: very rich. 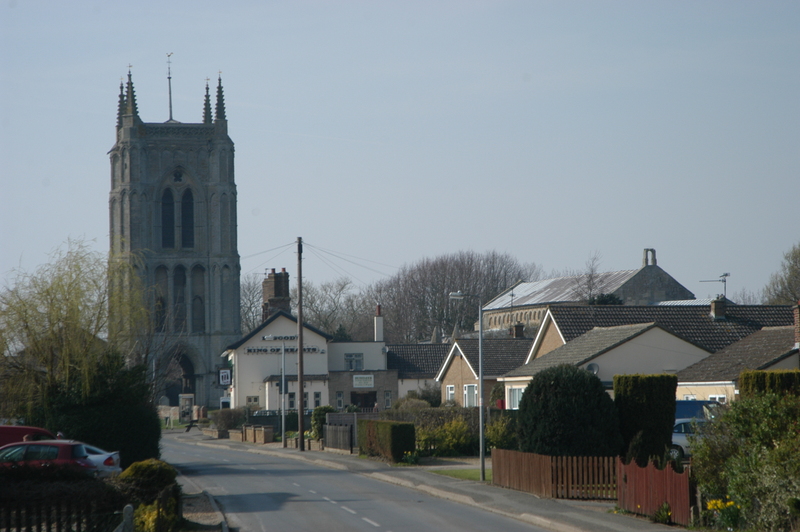 As early as the late eleventh-century Domesday survey, the Hundred on the Lincolnshire side, very nearby– the Norfolk boundary put’s the ‘west’ in Walton — was the richest in England; the country around it not much poorer. Salt, an essential commodity, was panned on the tidal side of the wall. Salt-preserved fish were traded widely. Agriculture was endlessly productive. Merchants, pilgrims, travellers, made their way across the only (mostly) dry route into East Anglia north of Cambridge. And in the course of the next few centuries, local people built and rebuilt a series of collossal churches. All this must go some way to explaining the scale of West Walton. It sits like a great yellow-and-grey broken-backed beast among the bungalows of what always feels like a rather benighted settlement. Yet even from a distance, one can sense the watery twists of its history: its whole profile has slumped, as if the landscape beneath it had buckled, drained and sunk; its collossal tower was built some distance away, as if nervous whether it could stand up at all. Closer-to, all this is even clearer. At a glance, this is a thirteenth-century parish church of the highest imaginable standard — one that has then spent centuries slumping and sinking and being roughly patched by jobbing builders. The result is a curious combination of the magnificent and the primitive, grandiosity and make-do, brazenly cosmpolitan and marshbilly local, all the living result of the underlying mix of fertile wealth and flooded instability which is the essence of this landscape. In some cases the result is quite bewildering. One can just make out the grandeur of the thirteenth century west front behind the collossal will-she-fall-down buttresses and plain-as-a-pikestaff windows put here in the C15 or C16, ignoring much of the detail of the very structure they strove to preserve. Something very odd has happened to the porch: its gable is a stepped affair in brick, as if patched by a travelling Dutch brick in around 1700; the polished stones that graced the shafting of its door have been replaced with columns of dry, untreated wood; the whole thing is one-and-a-half bays deep, as if it at some point it has been taken down, shortened, then hastily rebuilt. Yet the grand C13 model church that makes this place so significant survives; indeed for those of us who spent our adolescence working out the differences between EE and Perp, lierne vaults and crockets, it is something of a touchstone, as often cited as a ‘perfect model’ of Early English among parish churches as Salisbury is among cathedrals. Great energetic swags of stiff leaf along an arcade of 1230/40 elegance, with en delit shafting and complex moulding and everything that makes this canonic, linear, classical style so refined. Hierarchies of doorways: big south, smaller north, smaller priest’s, liturical trumeau to the west. 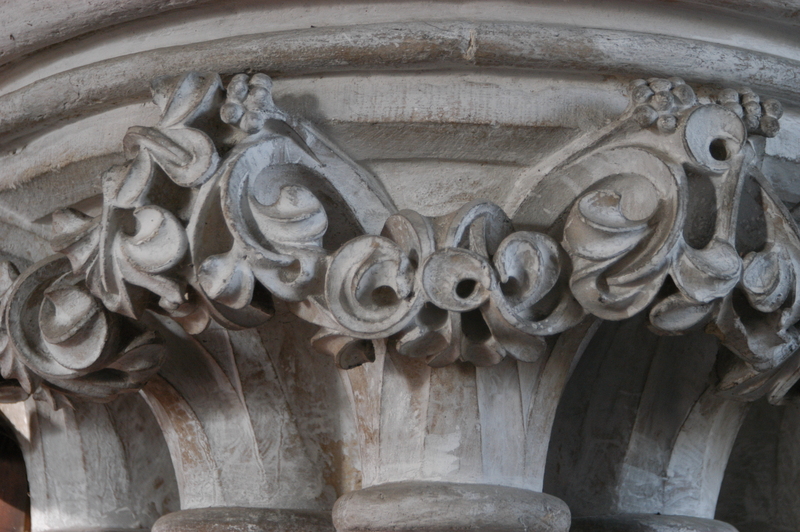 A palpable increase in quality of carving (never low) in the chancel, once clasped by aisle-end chapels (long demolished) and extending a full bay further east (also lost), an enhanced seperation of high altar from laity that is a mark of the era. Brackets for a lenten veil; blank arcades in the (original two) eastern bays. Indeed much of the very best is lost: the stumps of a triple lancet *nave* east window, fully two hundred years before any other surviving example I can think of, survive, replete with dogtooth and shafting. My favourite detail is the clerestory, a series of single lancets built into a blank arcade cleverly designed so the rythmn is A-B-A-B blank/open inside, but A-B-B-A on the exterior: subtle, playful, smart, and more to the point proof of a designer doing much more than just going through the parish-church motions. Here, inside and heavily restored, are rich traces of the former colour scheme: fictive ashlar on the walls; patterned painted ‘hangings’ featuring tile-like patterns (addorsed birds, etc) in the blank arches of the clerestory, big roundels (originally containing scenes? which might still be there beneath repaintings?) between the arcades. And then there’s the tower: solid, flat-topped, a magnificent composition of its own, with its four open arches imitating the arcade-gallery-clerestory of a great church. Is its location purely about stability? Given that, it must have been very important to someone that this church had a grand tower. And then there is the question of function: all four corners contain newel stairs, giving large-scale access to a central level that opens onto a platform. Is there something liturgical going on here? Commemorative (towers were associated with funerary rites in C11 Lincolnshire) or associated with Palm Sunday or Rogationtide, perhaps? Also delicious — and here the confusion of change begins – is the south-east window of the south aisle, one of the most elaborate confections of its era, with the latest bar tracery (no tracery elsewhere in the church,, indeed there is plate tracery in the tower so this really must be the latest innovation), and little fluerons and tiny stiff leaf splays running all the way up the richly moulded arch itself. This, weirdly, is the only C13 window to survive. Given the preservation of so much else, this is odd; given its elaboration, it is extraordinary. Are we really to believe that windows of this exhausting expensiveness lined the entire building? If not, this one must have had some special function. Has it, then, been moved, say from an eastern chapel? Yet a priest’s door is built in with it. Perhaps this whole wall comes from a bay further east, and the chapel here was of special significance? In any case, given the door it can’t be an east window, so there must have been openings of yet greater modish grandeur in the church. Then the changes start. There are windows of hte 1320s/30s, and a series of enormous flat-topped ones of the C15/C16. The whole north aisle is even more barn-like, and much rebuilt in the C17 or C18: great dry rustic beams of oak; simple post-Reformation openings; signs of instability going back to the late C13 or C14. All this gives the church its patched, tragic beauty — but also joyously, fills it with light, echoing the width and brightness of the East Anglian skies. C17 paintings on top of the roundels: a little series of the Tribes of Israel. 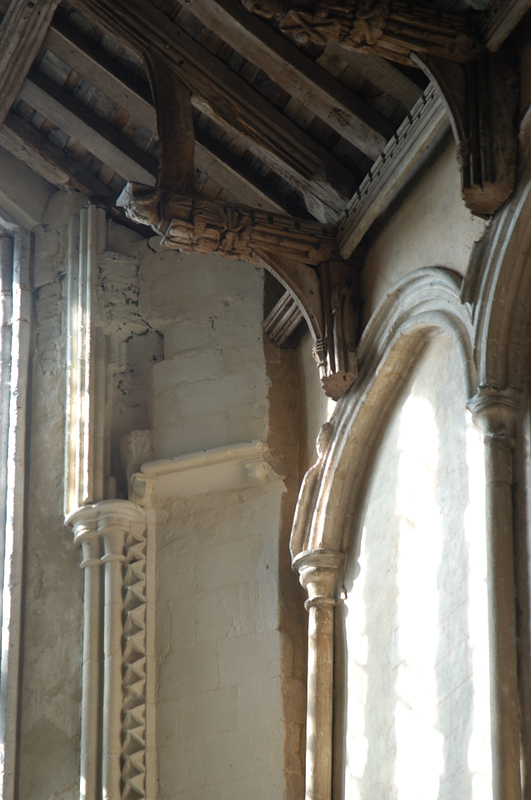 And a battered and slightly cut-price C15 hammerbeam roof, cracked badly mauled angels staring down in the dusty light. It is this battered beauty — and the contrast with the sophistication of the original building — that gives this church its place-rooted poetry. 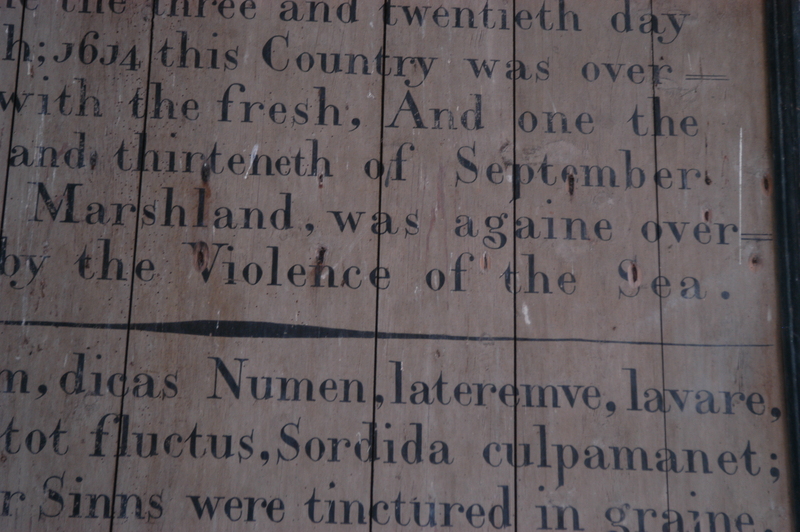 It is the C13 baseline that gives the church its art historical significance. And there comes a question: who is the patron? 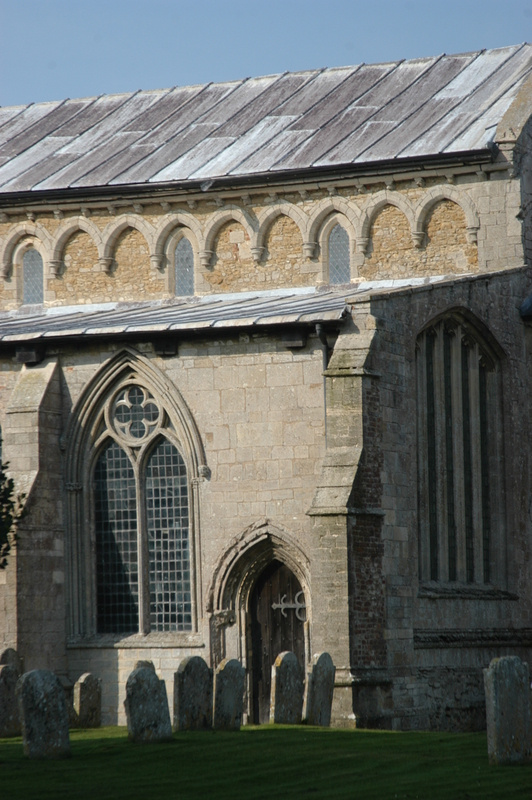 The architecture, like much around here (Binham, Crowland) looks to Lincoln rather than (say) Ely; at once grand and carefully modulated, it can be viewed at once attempt at a model parish church for the era. Yet the parish stands out in no other way I can find. Except that the manor was in the hands of Cluniac Castle Acre priory. And in one corner, next to a flat-topped tomb that has lost its brass, survives one of the building’s biggest surprises: a top-notch effigy of a C13 abbot, of the era that saw the very first major wave of such images; the kind of thing, then, that one normally only sees to the head of a religious house (or a senior aristocrat) in a major church. Sadly, the names of the priors of Castle Acre (or, conceivably, another related house such as Lewes) at this date lack toponyms: but the most natural conclusion is that a prior of one of these houses was born in Castle Acre and (like the contemporary Bishop Poore, builder of Salisbury) chose to be buried not in the great community to whose headship he rose, but in the parish of his birth, enriching and moderning its church lavishly as he did so. This effigy is something of a suprise in itself, but at least it gives West Walton a root, a context, an explanation. A grand gesture of the later 1230s, followed by centuries of root-deepening decline. Indeed this grand figure himself has a sad and Marshish history: somehow, he became detached from his church, and split in two; he was found in the nineteenth century in a nearby drainage ditch. A great work of sculpture, image of a living man of the 1230s and his works, pickled and broken among centuries of peat, flood and eels. West Walton embodied. Placards announce that the Beginning is Nigh; the model of an Imminent End — whether it be Resurrection or Revolution — is buried deep in the Western psyche: we hurtle forwards, perpetually about to fall off the cliff. But the end is also the beginning, and at St Paul’s they are rushing to roll the world back in deep time: stop the future, I want to get off. First, there’s the ancient nature of this site. The top of Ludgate Hill has almost certainly been the site of the cathedral of London since the earliest decades of English (as opposed to British) Christianity, when it stood in a liminal zone between the lost kingdoms of Kent and East Anglia. And there was a cathedral for London, site unknown but very possibly here, before the Romans left Britain (as opposed to England) to self-government after a few centuries of nation-building occupation. The country promptly reverted to a pre-historic state. So this hilltop has seen every insurgency and objection to How Things Are from Boudicca’s rebellion onwards; more than that, well before the Norman Conquest it had emerged as Paulsbury: much more than the emerging city’s sacred enclosure — bringing with it the overarching, besworded protection of the apostle most widely assigned, today, with Christianity’s revinvention as a faith of law and authority — it was the city’s premier public space, the embodiment of its community. So until the Guildhall emerged as a centre of lay, civic power at some point in the late medieval era, and long before modern conceptions like Trafalgar Square, Speaker’s Corner or Greenham Common where even dreamt of, this is where everything happened. Here, beneath an enormous freestanding belltower, was held the Folkmoot, an informal but politically powerful institution of rough, citizen’s democracy. Here stood Paul’s Cross, where bishops and others vied to grab an open air pulpit for sometimes controversial, often game-changing preaching: Lollards preached here, Reformationists, the opposition to King John. And here where other, just as populist, but more spiritually focused and equally unique, institutions: the outdoor passage to the north transept, with its great ‘people’s cloister’, where burghers vied to be buried before the Dance of Paul’s, a collossal painted reminder that the end is nigh and all finery would imminently be dust, before making their way towards the Black Rood found miraculously washed up on a Thamesside beach, and the gloriously transgender St Uncumber, patron saint of the abused wife. Other cults celebrated here also fused the irrational, the imaginative and the inspired in equally varying ways, from the anti-Edward II Thomas of Lancaster to the putative tomb of rebel-leader London Boy Thomas Becket. And now here they are again: bedecking the area between the west front, the north transept and the Chapter House with bunting, temporary art, a cluttered photocopy refuge of message from the inspired, the committed, the angry, the artificially intoxicated and the plain barking. As opposed to Barking. Cramming their way onto the York stone flags until the twin anti-puppies of the apocalypse, Health and Safety, run in terror before them. A week ago, there was a buzz to all this: our curious globally overheated Indian Summer shone off the Portland facade and Grinling Gibbons swags of free bounty, the golden orb of Queen Anne and her supplicant native peoples, the half-empty shanty of freely decorated tents. People spoke in open-sided tents, announced spontaneous and creative actions from the steps, slept out on the hard stone. Nows the place is more sombre, and crawling with people from news agencies in search of voxpops. the sky is overcast, a police helicopter poises with metallic-eyed surveillance above Wren’s dome, like a hovering steel raptor; and at some point in the next few days this temporary, threatening, righteous bloomage will be washed away. Of course all this was meant to happen in Paternoster Square. I don’t know at what point this aonze of offices left Paulsbury and became a privately owned development in the heart of the city, but the city traders based here acted swiftly when Occupy London first descended. All routes of access are sealed with crowd barriers, gaurded by police, security goons and a small army of female staff hoping to entice punters into the various high-end shops and restaurants therein, who must be losing money hand over fist. They stand there with menus, hoping to beckon passing bankers in to the empty concrete fake-Classical wasteland beyond, where a lone police car stands next to a miniature monument to the Great Fire of London. So just how nigh is this beginning?